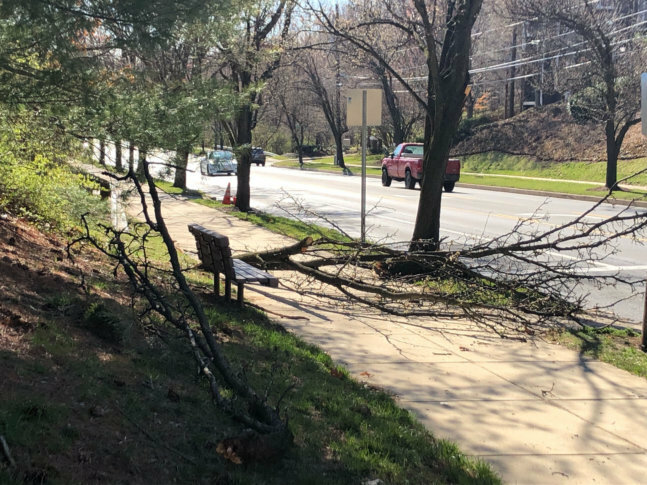 A man walking in North Bethesda, Maryland, was seriously injured Tuesday morning after a passing truck apparently struck a large branch, which then fell on him Montgomery County authorities say. The man, who is in his 30s, was hit by the falling tree branch while walking on the sidewalk in the area of Tuckerman Lane and Hampton Mill Terrace at about 9 a.m. Tuesday, Montgomery County Fire and Rescue Service spokesman Pete Piringer told WTOP. First responders said the man suffered traumatic injuries and was rushed to the hospital. His condition is still serious but not life-threatening and improved slightly on the way to the hospital, Piringer said. Witnesses told first responders about the truck striking the tree branch, Piringer said. The truck didn’t stop at the scene, although Piringer said it’s possible the driver didn’t know the truck struck the tree branch. The person who was injured was taken to the hospital with serious injuries, according to the Montgomery County Fire and Rescue Service. WTOP’s Teddy Gelman and Melissa Howell contributed to this report.